Soup is my default weeknight meal in the wintertime. With some toasted french bread and a side salad, we can have a filling meal in less than 30 minutes! Last week I grabbed a few things I had on hand and created a new one that we loved. Paul couldn’t get enough of it! 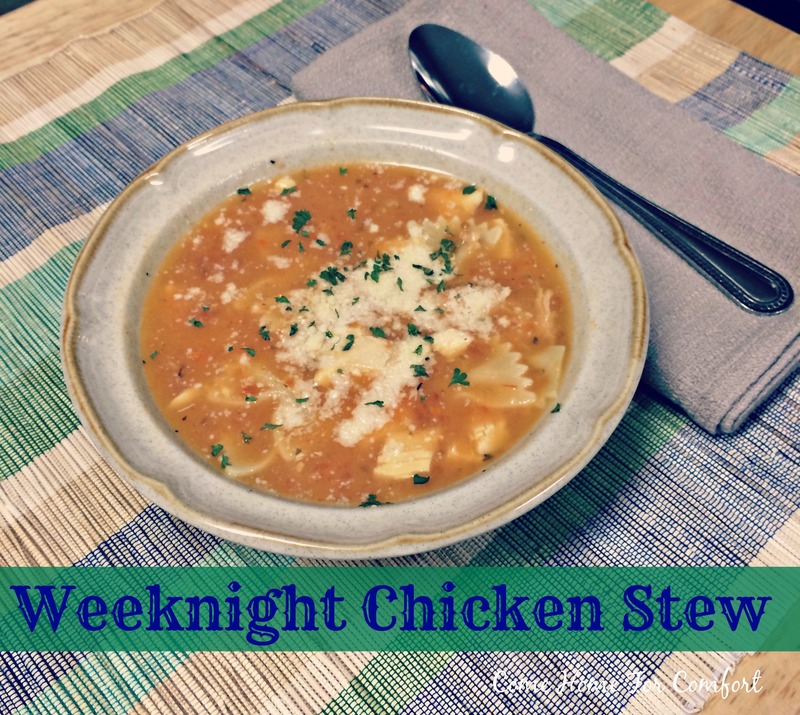 He said I should share it with you – so here’s my recipe for Weeknight Chicken Stew! Combine first five ingredients in a large pot. Bring to a boil. Add pasta and cook according to the package directions – although I suggest slightly under cooking the pasta. It will continue to cook while in the hot liquid. Serve with grated Parmesan cheese, if desired. Thanks, friend! We love it! It was so cold in our house today – this soup would have been perfect! There’s always tomorrow 🙂 Yum! Make a big mug of tea to go with it and you’ll be nice and toasty! Mmmm, I love vegetable soup. Paul doesn’t like whole veggies in soup (I puree the tomatoes in this recipe) so I never make it…but I do love it!